Rock Candy is a funky, adorable little hat that knits up quickly. 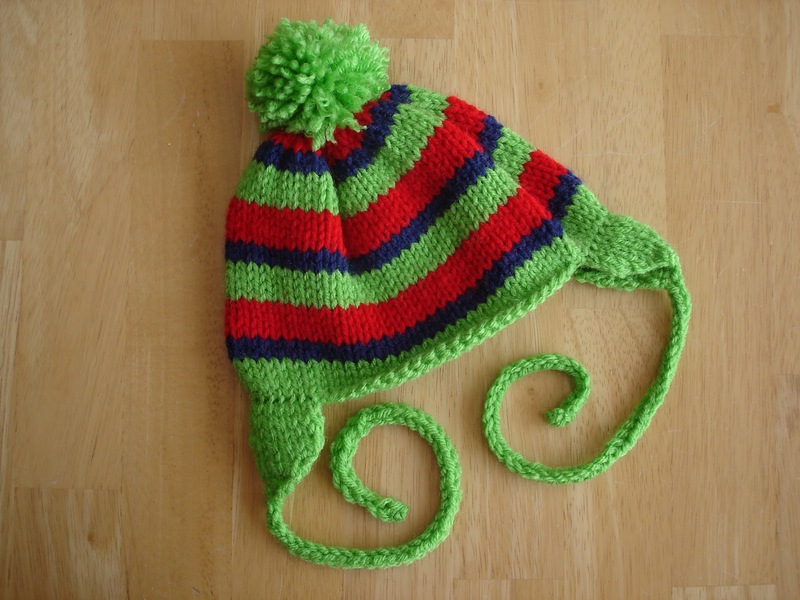 It is perfect for your little ones who won't keep a hat on. 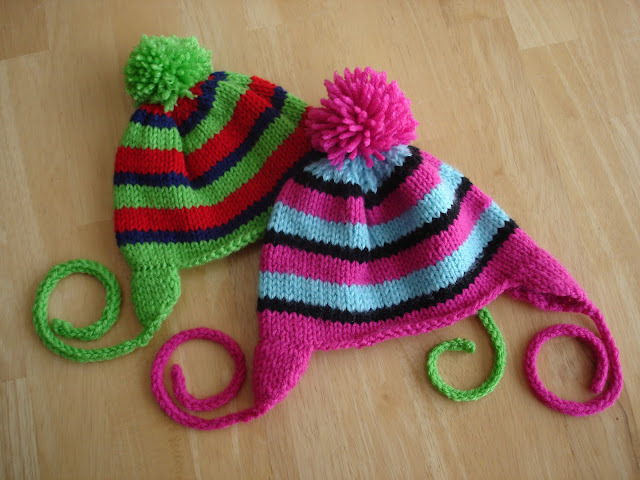 Customize hat with multitude of colors, or knit in a favorite solid color. Note: Heads come in lots of different sizes, please measure child's head first for best fit. CO 48 (56, 64, 72, 80) sts using color A, PM. Join in the round, being careful not to twist. Repeat until hat is roughly 5.5 (6, 7, 8, 8.5) inches from CO edge. Using color A, fold hat in half to determine placement (I placed a stitch marker on either side to mark the spot), pick up and knit 14 sts and work in st st for 4 rows, ending on WS row. With remaining 2 stitches, work i-cord for 12” inches (this creates enough length for a bow to be tied comfortably under chin). BO 2 sts and repeat again for the other ear flap. Weave in any remaining ends. 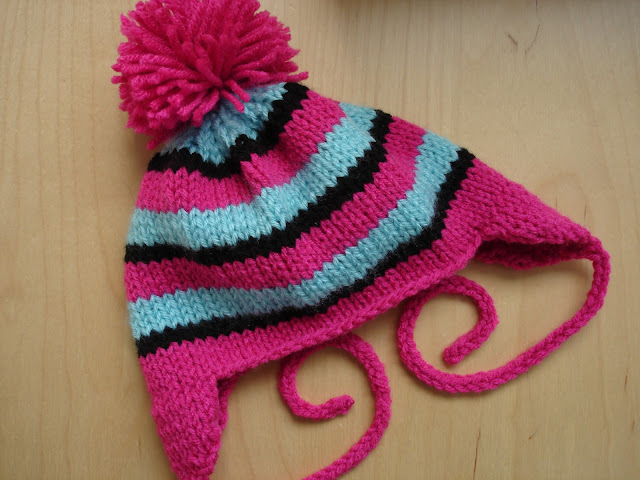 Add pom pom if desired and fasten to top of hat. Great pattern! It's my first time using circular needles or dpn. I'm getting ready to start on the crown. How will I know when I need to start with the dpns? Thanks!! This looks warm plus the biggest size is really universal. I love those strings too, they keep it in place! Hi there - I am having trouble with the gauge. My worsted weight yarn - Cascade 220. - is 5 stitches per inch and your gauge says 6 per inch. That seems more like sport than worsted. If I divide the toddler size CO number by 6, I get 12 inches. Does that mean the hat will stretch to fit? Should I go ahead and usr my worsted but adjust to CO 60? Any advice most appreciated! I've made this hat about 5 times last year & really like it. Thanks for sharing! I wish I had a picture of a baby with one I made. I do have one picture of one I took before giving as a gift. I am having a difficult time trying to calculate the positioning of the earflaps. I am making the one for a newborn (56 stitches), so by your sizing that would mean 14 stitches in the back and 14 more in the front and then the other two sets of 14 would be for the ear flaps, but people don't have their ears exactly on the sides of their heads, so should I adjust and perhaps put 10 stitches across the back and 18 across the front?? Is there any way you could do a video on the earflaps. I have never picked up stitches and not sure how to begin.